The Sumerians fixed this by creating different symbols with different values. Now we got 1 2 3 and 4, let’s get to the other numbers. To help you understand what is happening I’m going to let you see the invisible line that divides them. The circle below the lines (imaged below) has the value of five, because it’s like a closed fist. And also when it’s above the line it has value of ten, because raising your fist gets results (you know what I mean). But what made five and seven what they are today? In these numbers, the position of the line was still important so it began to be used. But increased the number of the strokes necessary to write the symbols. 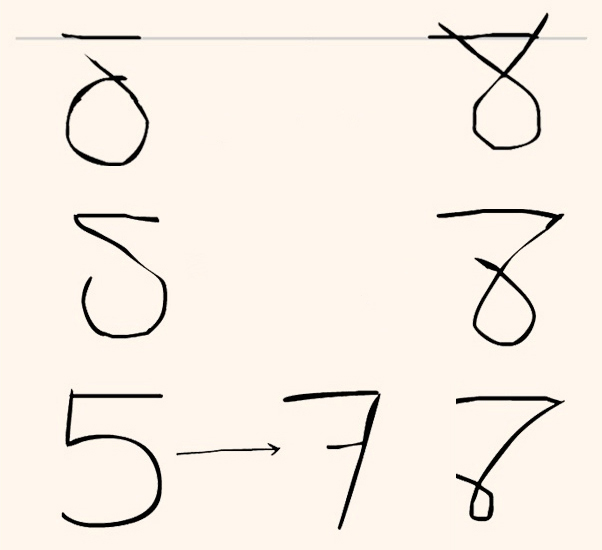 To reduce the number of strokes and make it easier to write, the circles gradually began to change. The five got a right angle to distinguish it from six, if you ever wondered why some people put this thing on seven, it's to honor what's left of the angles. But the circle in seven wasn't so lucky.